The aim of this work is to provide a comprehensive treatment-oriented introduction to the practice of child-clinical neuropsychology, focusing exclusively on the assessment of children and adolescents. The book has been designed specifically for those who wish to pursue education and training in this area of professional endeavor. The volume gives consideration to the following issues: treatment-oriented model of neuropsychological assessment (specification of brain-behavior relationships, dimensions of neuropsychological assessment, psychometric considerations, validity issues, modes of approach to neuropsychological interpretation, influence of demands of the environment, prediction of behavioral outcomes, development of realistic remedial plans and availability of resources for effective implementation of remedial plan, and continuing relationship between neuropsychological assessment and intervention); principles and hypotheses concerning the remediation of brain impairments in childhood and early adolescence; Variables related to the known or hypothesized brain lesion; determination of the child's remedial needs and remediable capacities, approaches to treatment (general treatment strategies, formats for intervention, treatment styles and techniques), and implementation of the remedial plan; learning disabilities (empirically derived LD subtypes, neuropsychological profiles, psychosocial typologies, and implications for treatment) and case studies (nonverbal learning disabilities and basic phonological processing disorder); and neurological disease, disorder, and dysfunction (approach to characterization of neurological disorders) and case studies (stroke, Asperger syndrome, traumatic brain injury, brain tumor, and Tourette syndrome). This book will be of critical interest to child-clinical psychologists, neuropsychologists who specialize in the assessment and/or treatment of adults with brain impairment and have some interest in childhood disorders, pediatric neurologists, child psychiatrists, and a host of other professionals whose practice brings them in contact with children whose behavior may be affected by brain dysfunction. 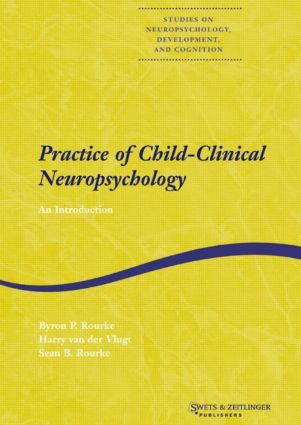 Indeed, for all of these professionals and those in training to become such, this book will serve as a comprehensive introduction to a systematic approach to neuropsychological assessment and intervention for children and adolescents with suspected or established brain impairment. Child Clinical Neuropsychological Assessment. Remediation for the Child with Brain Impairment. Illustrative Case Study. Learning Disabilities. Neurological Disease, Disorder & Dysfunction. Appendixes: The Child-Clinical Neuropsychologist. Neuropsychological Test Battery. Additional Test and Measures. Treatment Program for the Child and Young Adolescent with NLD.